If you like gardening and art then you will enjoy making these feathery friends. What will you need to make these creatures? The supplies you will need are a dried apple gourd (you can grow them or buy them at most craft stores), two or more colors of poster paint, three pieces of white paper, 2 pieces of firm bendable wire, three feathers and a pipe cleaner. The tools you will need are scissors, pliers, wire cutters, a hot glue gun, and a paintbrush. Not all the supplies are shown in the picture. The first thing you need to do is paint your dried apple gourd. If you have a choice paint it a light color. Pull off the stem. Once you have completed painting let the paint dry. Once your gourd is dry its time to paint the wings and eyes. Choose a different color poster paint (preferably a darker one) and paint a water drop shaped wing on each side of the bird. If you want the bird to look fat then leave about 3 inches of space between the wings. If you want the bird to look skinny leave less space between the wings. For eyes you can just paint dots on the side of the head. The beak is simple. Take the piece of paper and cut it into a triangular shape. Next roll it up and glue it together. Wait for the glue to dry then paint it. Once the paint dries use the glue gun to attach the beak. Place it below and between the eyes. To make the tail use the scissors to cut your feather so its about 1 1/2 inches long. Next glue the feather to the back of your bird. If you want you can paint the feather the color of the wings. If you plan on making only 1 bird you can attach a wire to the bottom so you can stick it in a flower pot. To do this use the pliers to rap one end of the wire into a curly-cue shape. 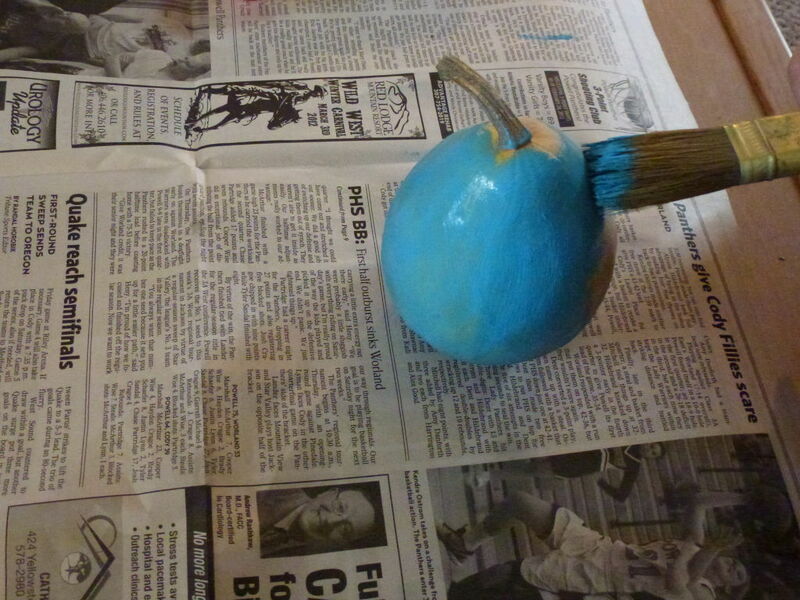 Next, use the glue gun to attach the curly-cue to the bottom of the gourd. Now you can stick the strait end of the wire into the ground to make a neat garden decoration. If you want to make 3 birds sitting on a telephone wire then you will need to make 2 more birds. Once you have completed this task you will need to straiten a piece of wire.Glue the wire onto the bottom of the birds. Let the glue dry then cut off any extra wire on the ends and straiten another wire. Get out the pipe cleaners and rap them around the wire 3 times so they look like feet. Make 2 feet for each bird. Finally, glue the wire with the pipe cleaners on it to the bottom of the birds. Now your done making your cute little gourd birds!!! You can use them to decorate a flower pot or put them on a shelf. I hope you enjoyed making your birds! these are cute. i will be sure to make some and hang them from the ceiling!